It’s no fun only being able to enjoy your pool a few months out of the year. Whether you have a small above ground pool or larger in-ground pool, it’s an investment you deserve to enjoy anytime you want. A quality pool heater can allow you to do just that. However, with so many options out there, how do you know which one is best for you and your pool? Well, that’s where this guide and our pool heater reviews come in. With decades of experience installing and working with every pool heater under the sun, you can rest assured you’ve come to the right place to find the best pool heater for you and your home. So, go ahead and dive right in! The Pentair 460736 400,000 BTU MasterTemp Pool Heater offers the quality, efficiency, and reliability, and performance pool owners have come to expect from Pentair. As one of the best pool heaters being made today, the Pentair 460736 sets the bar in terms of heating efficiency. Harnessing the heating power of natural gas and providing 400,000 BTUs of heat output, it’s capable of quickly heating pools up to 40,000 gallons in size. This makes it an excellent option for any in-ground pool owner in search of instant gratification and comfortable quick dips. Beyond its amazing heating capabilities, the Pentair 460736 400,000 BTU MasterTemp Pool Heater also features an easy-to-use rotating digital display with digital controls, electronic ignition, water pressure switch, high limit switch, and stack flue sensor to keep it running just like you want whenever you want. So, if you’ve been left out in the cold and find yourself scouring through pool heater reviews in search of a great gas pool heater for your frigid pool, look no further than this Pentair. It may prove to be your best investment yet. It may lack in the BTU department with only a 50,000 BTU output, but the Hayward HP50TA Residential Pool Heat Pump is without a doubt one of the best pool heater options on the market today. In fact, the high-quality heat pump is able to warm a 15,000-gallon pool well into the 80s within just a couple of days. If that weren’t impressive enough, the Hayward HP50TA is also super energy efficient. It may cost more than a standard electric heater or gas pool heater with more BTUs, but its 84 percent efficiency rating will save you a ton each month on your utility bill. Unlike big and bulky pool heaters that take up space and are difficult to install, this impressive Hayward boasts a compact, lightweight design. It also offers a myriad of features designed to boost its performance and make it easier to use. For example, it features a premium Ultra Gold coated evaporator coil, titanium corrosion-resistant heat exchanger, and a digital LED control panel giving you complete control over the unit with the press of a button. When you factor in its quiet operation and extremely durable polypropylene exterior construction as well, it’s easy to see why the Hayward HP50TA 50000 Titanium Residential Pool Heat Pump is consistently recommended in pool heaters reviews as one of the best options around. The versatile Hayward H150FDN 150,000 BTU Natural Gas Pool Heater is another popular gas model and a shining example of Hayward’s dedication to making efficient, top-quality pool heaters that perform second to none. Boasting unique, energy-efficient hydraulic performance, the Hayward H150FDN is able to warm up an 800-gallon swimming pool by up to 30 degrees in just over an hour and keep it nice and warm as long as you like for the wildest of pool parties and the coolest of days. Best of all, it reduces pump circulation as well, which means you can enjoy your pool well into winter without noticing much of a difference in your utility bill. Like all of Hayward’s top-rated Universal H-Series pool heaters, the Hayward H150FDN 150,000 BTU Natural Gas Pool Heater also features hydraulic performance and offers superior thermal efficiency. With a polymer header, corrosion-resistant heat exchangers, Cupro nickel combustion chambers, electronic ignition, dual thermostat, and LED display with digital push-button controls, it’s hands down one of the best pool heater options available for today’s performance and energy-conscious pool owners. As one of the top rated pool heaters being made today, the Hayward H150FDN is also designed with versatility in mind. For instance, thanks to its Cupro nickel heat exchanger, it can be used with both chlorinated and saltwater pools. It also allows you to connect the ports and the electric on either side, making installation a breeze. With all of this going for it and a reasonable price tag to boot, this first-class Hayward pool and spa heater is hard to beat. You won’t find it mentioned in many pool heater reviews and it lacks the pool heater ratings of the popular models above, but as far as true electric pool and spa heaters are concerned, the Raypak 11kw Electric Spa Heater is one of the best. Designed to be durable, dependable, and provide you with high-performance efficiency, the Raypak is a wise choice for heating a spa or small above ground pool. Although it doesn’t meet low NOx requirements, it has a corrosion-free construction that’s built to last for years and an efficiency rating of 83 percent, earning it two thumbs up in both durability and performance. The 11kw RayPack Electric Spa Heater only puts out 38,000 BTUs, so it’s not ideal for large in-ground pools. However, thanks to its heavy-duty heating elements, high limit temperature control, pressure control switch, and high-quality thermostat, it performs extremely well and is an ideal heating solution for spas and most above ground pools. The TRANE TR400NA 400,000 BTU Natural Gas Pool Heater utilizes some seriously advanced technology for enhanced adaptability, easy use, and powerful performance, making it arguably the best pool heater you’re hard-earned money can buy. Built for durability, the TRANE TR400NA features a Cupro nickel heat exchanger, which is far superior to the copper heat exchangers found on many less expensive units. Of course, it’s extremely energy efficient as well, allowing you to enjoy superior thermal and hydraulic efficiencies without paying an arm and a leg each month. This impressive pool heater also features a patented polymer header for superior hydraulic performance and an intuitive LED control panel for digital diagnostics, temperature readings, and accuracy. This means you can set your pool to the perfect temperature and dive right in knowing the water will be just right. It may cost a pretty penny, but, if you’ve been reading swimming pool heaters reviews hoping to find the best of the best, the TRANE TR400NA is exactly what you’ve been looking for. Similar to the smaller, less powerful H150FDN discussed above except more powerful and capable of heating up your pool even quicker, the Hayward H300FDN Universal H-Series 300,000 BTU Natural Gas Pool Heater is one of the best around. Featuring an energy-efficient hydraulic design, the Hayward H300FDN is capable of heating up the largest of pools by up to 20 degrees in under an hour. Like other Hayward Universal H-Series pool and spa heaters, it also features a polymer header, Cupro nickel combustion chambers, corrosion-resistant heat exchangers, dual thermostat, electronic ignition, and modern LED display, all of which combine to provide you with one of the absolute best swimming pool heaters in the business. Performance aside, this mighty little pool heater will save you money as well. In addition to its incredible thermal efficiency, it’s designed to reduce pump circulation and save you even more money. Talk about cool. You could read endless pool heater reviews and be honestly hard-pressed to find another model as capable as this Hayward. So, if you want a great pool heater, do yourself a favor and check it out today. You’ll be glad you did. Built to last forever and outperform virtually every other swimming pool heater out there, the Sta-Rite SR400NA Max-E-Therm 400,000 BTU Natural Gas Pool Heater is considered by many the best pool heater on the market. With a rust-proof exterior, premixed combustion technology, and precise temperature controls, it works heads and shoulders above many of its competitors. How so, you ask? Well, for starters it’s extremely energy-efficient and features a compact, lightweight design for super easy installation. With 400,000 BTUs of natural gas power, it’s also capable of heating an Olympic size pool from a frigid 50 degrees to a balmy 80 degrees in just a few hours. Built with state-of-the-art Dura-Glas technology, the impressive Sta-Rite Max-E-Therm 400,000 BTU Natural Gas Pool Heater is nearly indestructible and made to withstand the harshest of weather conditions. As is the case with many of the other models mentioned in these swimming pool heater reviews, the Sta-Rite also comes equipped with an easy-to-read LED display and intuitive pushbutton controls. This makes it easy as can be to monitor and adjust the water temperature of your pool. Sure, it looks more like R2D2 than a state-of-the-art pool heater, but if you’re on the hunt for modern, compact swimming pool heater that will perform like a champ for a lifetime, look no further than the Sta-Rite SR400NA Max-E-Therm. Aside from solar pool heaters, the 55,000 BTU Fibropool Electric Swimming Pool Heat Pump is one of the most environmentally-friendly and energy-efficient pool heaters available. With its electricity usage on par with that of a table saw, this is the pool heater to get if lower energy bills are a top priority. Just because it’s energy-efficient, however, doesn’t mean it’s weak. The 55,000 BTU electric pool heat pump is able to warm the water of a 10,000-gallon in-ground pool or 21-foot above ground pool in just a few hours. While big and bulky, the Fibropool is surprisingly quiet and easy to install. In fact, unlike many other pool heaters out there that require professional installation, this electric unit can be installed in under 20 minutes. You can read pool heater reviews for hours and be lucky to find such an easy-to-install option. When you factor in its digital display and control panel, weatherproof construction, titanium heat exchanger, rotary compressor, and helpful flow switch safety feature, it’s easy to see why the Fibropool 55,000 BTU Electric Swimming Pool Heat Pump is included in this list. If you want a great all-around pool heater designed to extend your swimming season and save you some green, don’t sleep on this Fibropool. The Pentair 460732 250,000 BTU MasterTemp Natural Gas Pool Heater delivers the reliability, efficiency, and convenience thousands of pool owners have come to expect from the Pentair brand. Made to be one of the best pool heater options on the market, the incredibly efficient Pentair 460732 is equipped with all of the bells and whistles and able to heat a large in-ground pool in record time. To achieve this, the popular 250,000 BTU pool heater features a fully pre-mixed heating system with an ultra-efficient gas and air mixture, hot surface pilot light, and push button controls that put its power completely in your hands. Speaking of power, the Pentair has plenty of safety features to harness its power as well. With a high limit switch, stack flue sensor, water pressure switch, and a manual gas shut-off, you can rest easy knowing it will never overheat and always perform at its best. With every pool heater feature you could ask for, it’s definitely an option to keep on your short list. Last but not least and the only solar pool heater review on this list, the Smartpool SunHeater Solar Pool Heater is an ideal option for the budget-and environmentally-conscious. Similar to other solar pool heaters, the Smartpool SunHeater operates by running pool water through special panels that collect and transfer heat from the sun. The warmed water is then returned via piping back into the pool, thus increasing its overall temperature. While the solar power Smartpool SunHeater isn’t capable of heating up water as much or as fast as a natural gas or electric model, it works quite reliably as advertised and is a great option for most above ground pool owners. Each Smartpool SunHeater features a 4-foot x 20-foot panel array, but you can add as many as you like depending on the size of your pool. The panels work best when placed on the roof of your home, and while an installation kit is sold separately, most users recommend going the DIY route and purchasing the couplings, fittings, and so on themselves. Regardless of which route you choose, the Smartpool SunHeater Solar Pool Heater is a great value and ideal if you live in a warm, sunny climate and want to warm up your pool by up to 10 degrees. It’s good for your wallet and the environment, extends the swimming season, and makes your pool water more comfortable to swim in. What else could you ask for? If you’re wondering what is the best pool heater for you and your home, you’ll be happy to know choosing a pool heater is far from rocket science. However, it does take a little planning and careful consideration. After all, the last thing you want to do is pony up for a pool heater and go through the installation process only to find out it isn’t suitable for your pool and needs. There are quite a few factors to consider when deciding on a swimming pool heater, but the very first one to check off the list is the actual type of heater you want for your pool. Solar heaters are inexpensive and won’t cost you a dime after installation, but they only work for smaller pools and take longer to heat up. Electric pool heaters work better, but still take at least a few hours to begin producing warming results. Natural gas pool heaters work great, but they can be costly to run. You must consider your budget, needs, and lifestyle in order to pick the right type of pool heater for you. After deciding on the type of swimming pool heater you want for your pool, you must then determine the right size heater for your pool. Most pool heater reviews simply recommend certain models and neglect to stress the importance of choosing the right size model for your pool. However, this step is critical, so listen up. Swimming pool heaters are rated according to their BTU output. Each BTU, or British Thermal Unit, is capable of warming water one degree Fahrenheit per pound. Therefore, the greater the BTUs produced by a swimming pool heater, the quicker it will be able to heat up a pool. Since swimming pools are located in different climates and come in different shapes and sizes, to pick the best pool heater for your specific pool you must perform some basic math and calculate two variables: the temperature differential and surface area of your pool. After you’ve calculated the surface area and temperature differential of your swimming pool, you can refer to the chart below to determine the number of BTUs you’ll need to keep your pool at your desired water temperature. When you have calculated the surface area of your pool and considered these factors, choosing a pool heater is simply a matter of checking the numbers against a sizing chart like the one above. Of course, there are other factors to keep in mind as well. Durability, brand recognition, energy efficiency, ease of installation, and your budget should all be taken into consideration in order to select the very best pool heater for you and your pool. Solar swimming pool heaters make use of solar panels to collect and transfer heat from the sun to pool water. The water is simply circulated from the pool and into panels where it is warmed before being returned to the pool. It may seem obvious, but since solar pool heaters are dependent upon the sun to warm up water, they work best in sunny, warm climates. The majority of pool owners who utilize solar pool heaters also use an auxiliary pool heater at night or on cloudy days. Solar heaters don’t require any additional operating costs. They are extremely energy efficient. Similar to heat pumps, solar pool heaters are designed to last for decades. Solar pool heaters utilize renewable energy and have no emissions whatsoever, making them the most environmentally-friendly pool heating option. While inexpensive to operate, solar pool heaters only work well in sunny climates. They heat water much slower than other types of pool heaters. If you’re searching for the best pool heater, chances are a propane or natural gas pool heater is what you’re looking for as they offer unparalleled heating performance. With these types of heaters, a combustion chamber is used to warm the water. Basically, water is pumped out of the pool and goes through a super-hot tube before being returned 20, 20, or 30 degrees warmer. Although propane and natural gas heaters work the best, they can be more costly to run. Since they work so well, however, you only have to turn them on a few minutes before diving in, rather than hours or days beforehand. This allows you to save some money and provide you with convenience unmatched by any other type of heater. Most gas pool heaters are less expensive than other heating options. Gas pool heaters heat up water very quickly, making them ideal for anyone who likes to take short dips. As the most popular type of pool heater, there are many models to choose from with solid pool heater reviews. Since they run on electricity and utilize natural gas, gas pool heaters can be costly to operate. Most gas pool heaters have an energy efficiency rating of 80-8 percent, making them one of the least efficient pool heating options. Due to their reliance on fossil fuels, gas pool heaters aren’t environmentally friendly. Electric pool heaters warm up pool water by heating up a metal coil, which in turn heats up the water. Although electric pool heaters are often less costly and easier to install, they’re also the least efficient. Due to the amount of electricity needed to heat up an entire in-ground or above ground pool, it usually makes them an unwise choice for most pool owners. While hot tubs and spas typically use electric heaters, they’re much smaller than pools, so they heat up faster and use less energy. Nonetheless, given their cost of operation, you’re likely better off going with a heat pump or natural gas pool heater. If you’re thinking of going with an electric heater, make sure to review your utility company’s pricing structure, as rates usually skyrocket after reaching a set limit of kilowatt hours. This information isn’t provided in most pool heater reviews, but you’re here for an honest opinion and honesty is what you’ll get. Electric pool heaters are generally less expensive than other types of pool heaters. Unlike solar and gas pool heaters, electric pool heaters tend to be easier to install. Electric pool heaters don’t release harmful emissions, making them more environmentally-friendly. Unlike gas heaters, electric pool heaters take a while to warm up water. Most electric heaters aren’t suitable for large in-ground pools. Heat pumps pull in warm surrounding air and use compressors to optimize the air to the right temperature. They then transfer the heated air to pool water, resulting in an efficient and ecofriendly way to warm up the largest of swimming pools. Heat pumps are generally more expensive than the other types of pool heaters. However, they work extremely well and are capable of heating up a pool to a comfy temperature, even when it’s below 50 degrees outside and frost is in the air. While costlier than natural gas heaters, they work just as well and cost far less to operate, making them a solid option for any pool or spa owner. Heat pumps are very energy-efficient and cost less to operate. Most heat pumps are incredibly durable and designed to last for up to 20 years. Although they run on electricity, heat pumps don’t produce harmful emissions, making them a more environmentally-friendly pool heating option. 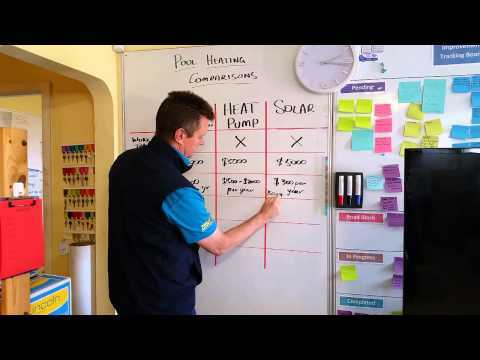 Heat pumps cost more upfront than other types of pool heaters. Unlike gas swimming pool heaters, heat pumps take longer to heat up water. Since they rely upon outside air to heat the water, heat pumps aren’t ideal for colder, northern climates. Similar to an outdoor furnace, a wood burning pool heater features a combustion chamber where wood is burned to create heat, which warms up water in a circulation pipe. Although they do their job well, wood burning pool heaters are quite archaic and inconvenient, requiring pool owners to add fuel to the fire throughout the heating process. There’s no such thing as an in-ground pool heater per se, but some people choose to classify pool heaters according to the type of pools they’re heating. The truth is heat pumps, natural gas pool heaters, and even some solar heating systems can be classified as in-ground pool heaters. Whether or not one of these types of pool heaters is suitable for your in-ground pool largely depends on its BTU output and energy efficiency. Like in-ground pool heaters, almost any type of pool heater can fall into this category. Natural gas heaters, heat pumps, electric heaters, and solar heaters can all be used to warm up above ground pools. That being said, unless you have a huge 40,000-gallon above ground pool, chances are you’ll be better off going with an electric or solar heating option. If you like the power and performance of natural gas heaters and decide to go that route, make sure to use the pool heater sizing chart to determine how many BTUs your pool requires. Whether you have a sprawling in-ground pool or a smaller above ground version, having a pool in your own backyard is a great way to have fun and beat the summertime heat. With a quality pool heater, you can even extend the swim season well into winter and enjoy warming therapeutic waters on brisk days and chilly nights. However, depending on the type of pool you have, there are some considerations to be made. This pool heater comparison will help shed a little light on the differences between above ground and in-ground pools. In addition to being smaller in size, above ground pools lose heat faster than in-ground pools. Since in-ground pools are surrounded by insulating dirt, they only lose heat from the surface, not the sides. Above ground pools, on the other hand, lose heat from the sides as well. Therefore, although they’re typically smaller, above ground pools require nearly as much power as larger in-ground pools in order to keep up with their heat loss. That being said, due to the size of in-ground pools, in-ground pool heaters are designed to utilize higher flow rates to heat larger volumes of water. So, while two different pool heaters may have the same BTU output, one may actually have higher flow rates and perform better for in-ground pools. Any pool heater will add some warmth to your pool. However, if you have a large in-ground pool and an above ground heater, you may only be able to warm the pool water by 10 degrees or less. With a larger in-ground pool heater, on the other hand, you can raise the temperature of your pool by up to 30 degrees, regardless of how cold it is outside. Needless to say, if you’re reading pool heater reviews in order to find the best pool heater, chances are an in-ground pool heater is the way to go. If you’re considering installing a new heater for your pool or replacing an old one, you might find yourself in a dilemma. 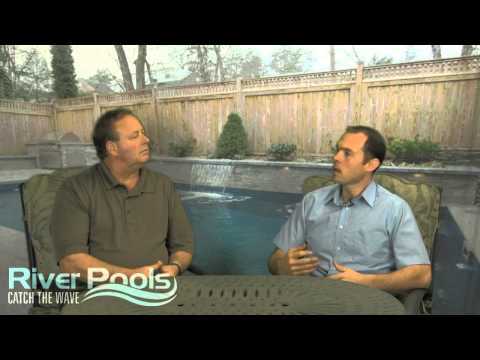 Should you choose a standard natural gas pool heater or a swimming pool heat pump? There are quality models in both categories capable of heating the largest of pools, but there are some distinct differences between the two that deserve a closer look. Both heat pumps and pool heaters are designed to effectively heat up pools, but they do so in different ways. Traditional gas heaters use natural gas that is piped to the unit. A propane heater is another option, but they’re more costly than natural gas and you will have to look at a propane tank in your yard each day. Heat pumps, on the other hand, utilize electricity and function much like an air conditioner, except in reverse. While both types of pool heaters will result in an increase in your gas or electric bill, heat pumps are much more efficient, resulting in little to no energy loss. This, combined with the fact that it takes much longer for a heat pump to actually begin heating up water, means heat pump owners usually leave them running around the clock. By nature, gas pool heaters produce heat extremely quickly, but are generally much less efficient. Therefore, individuals with gas pool heaters only run them as needed and turn them off after use. As mentioned earlier, pool heaters rely on natural gas that must be piped from the street or propane that must be filled. They also need electricity in order to power the controls and the spark igniter. Heat pumps, however, only require a 220V electrical line, making them easier and less costly for most pool owners to install. Due to these differences, many people benefit more from heat pumps in the long run. Although they generally cost more than pool heaters, they’re much more efficient and cost less to operate, even when left running. On the downside, heat pumps aren’t designed to work well in colder weather. In fact, some heat pumps quit working below 50 degrees, making them fine for residents in Florida or southern California but less useful for those living in colder climates. If you’re on the hunt for the best pool heater, you really can’t go wrong with either option. Both types of pool heaters have their pros and cons, so consider each of the factors we just discussed, read the pool heater reviews above one more time, and choose the type of heater that best suits your needs, budget, climate, and lifestyle. A quality pool heater can improve your lifestyle and allow you to get the most out of your backyard oasis. However, since different people live in different climates and have different needs, it’s important to use what you just learned to select the right pool heater for you and your pool. From heat pumps and gas pool heaters to solar and electric pool heaters, there are several different types of pool heaters out there to choose from and dozens of different models all vying for your hard-earned buck. Fortunately for you, you now know more about pool heaters than some technicians, which should make choosing the best one for you and your pool much less daunting. Whether you want a cheap pool heater for an above ground pool or have a sizable budget and an in-ground pool, one of the excellent pool heaters above is sure to be a great fit for your budget and needs. All you have left to do is pick one out. Before you do, however, do yourself a favor and avoid the temptation of buying the cheapest pool heater you come across. It may be tempting to save a buck, but you’ll likely spend more down the line and suffer plenty of frustration along the way. Winter’s right around the corner, so consider your needs, put what you’ve just leaned to use, and scroll back up this page to pick out a proven pool heater today!